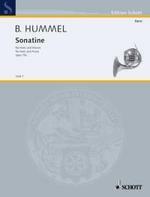 The Sonatine for Horn and Piano, Op. 75a, was written in 1981. The goal was to offer a musically stimulating recital piece for aspiring hornists. The work provides the soloist ample opportunities to demonstrate technique and musical creativity. The first movement (Maestoso) employs a neo-classic approach to thematic development. Two motifs are developed from the initial theme and are presented in a dialogue between the horn and piano, allowing the interval of the Perfect fourth to be a germinal figure tying the movement together. The second movement (Ballade) allows the ensemble to recover from the rigid motif oriented work of the first movement. The quasi-improvisatory nature of the haunting horn theme gives way to agitated canon at the piu mosso. The opening theme returns for a pastoral conclusion. The third movement (Finale Presto) is a burlesque Rondo with mixed meter, which provides an "enjoyable turbulence". The first theme is one of playfulness and gaiety which provides good contrast to the impish quality of the second theme which becomes ever more impetuous. The coda hearkens back to the primary theme of the first movement and finishes the work in bravura fashion. In contrast (Suite for horn solo op. 64), Hummel's Sonatina for Horn and Piano, composed in 1981 and first performed in Japan in 1982, is worked out with far more discipline, especially in the first movement which is modelled on Mozart's ,,Hunt Sonata" (Hummel). Two motifs spring from the first subject and are passed back and forth between the instruments in separate developments. And nevertheless it seems that the technique is used only as a means to an end, namley to breathe life into this hugely conceived formal organism. Due to its freely-spun songlike melody, the balladesque middle movement affords both players and listeners a measure of relief from the rigour of the thematic-motivic treatment of the first movement. The finale, subtle in its succession of rondo-like repetitions interspersed with fresh ideas, returns to the earlier severity.